I know I should probably be writing about my New Year’s Even in Siem Reap but I have been and will continue to be very busy with my new job with a travel company for the next 10 weeks. I still have to upload pictures then I’ll do a late post. The last two weeks have been filled with back to back dinners with friends, reunions and consecutive Cambodian wedding parties. 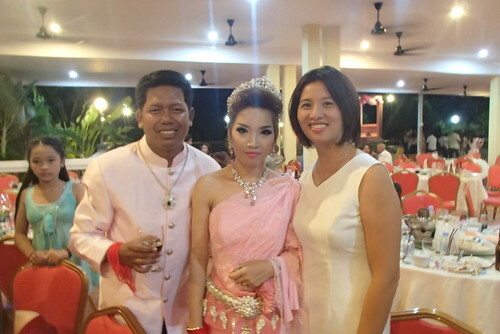 I love the openness of Cambodian weddings. One of my friends asked her cousin to give me a formal invitation so that was very sweet. I’ve really enjoying spending time and getting to know their families. My very sweet friend Mara who got her cousins to invite me. 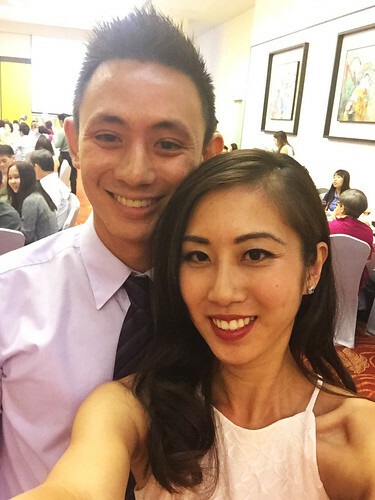 I went to the smaller pre-wedding party at the house which was really fun. 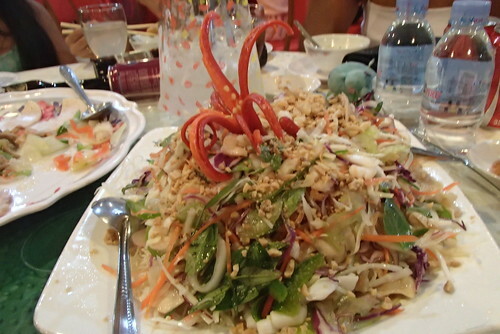 We ate Cambodian food, there is as usual an unlimited supply of beer and soft drinks, karaoke and dancing. Every time I go over my friend’s place, they are extremely hospitable in typical Cambodian fashion and offer to share their food and ask if I’ve eaten. I was really impressed with my friend too, I know she was so busy helping them prepare for many things, but when she saw that my ice was low on my drink she refilled it for me. Wow, talk about being a great host. Girls just wanna have fun. 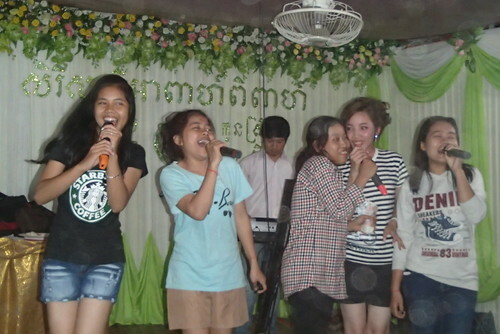 Cambodians love karaoke. 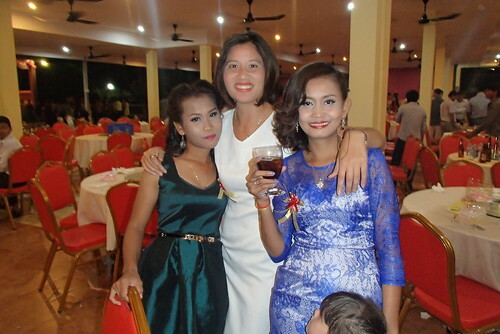 Last year I went to three Cambodian wedding parties in total and three weeks ago I went to three in a weekend. Her cousin’s wedding had the best food of all the weddings I went to and was at a restaurant. It was a fantastic time and I got to meet more nice people. Great way to spend a Monday night. 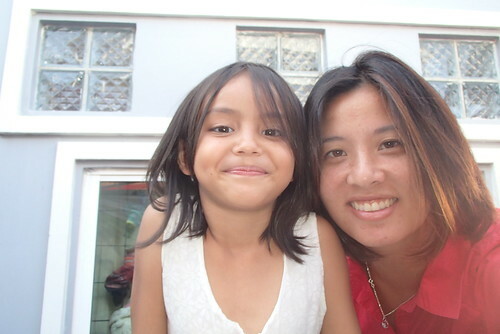 Mara’s fun, intelligent and adorable daughter. 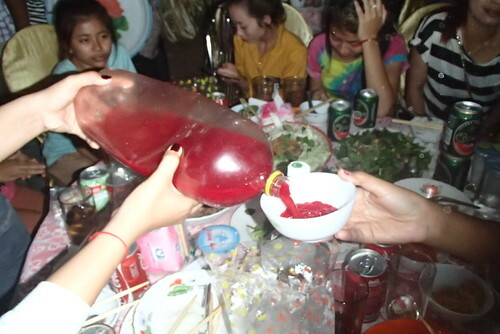 This is not soda, it’s duck’s blood. The real Cambodian food. 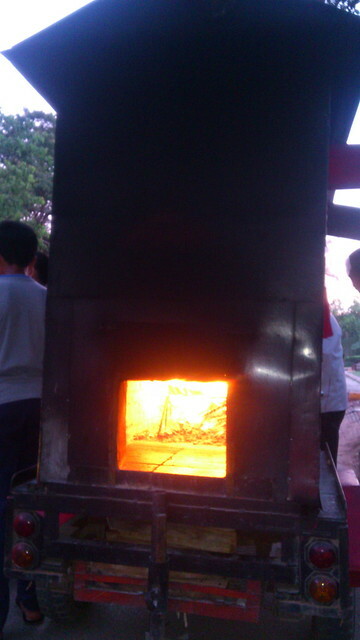 There were at least 700 people at the restaurant of the wedding dinner. I don’t think I’ve ever been to such a big restaurant in Cambodia. Picture before security kicked us out of the display booth. 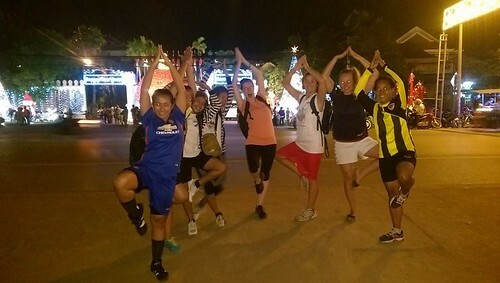 I’ve become very close to many of the women on my football team in Siem Reap since we met two months ago. It’s refreshing to have a group of people to can constantly laugh, be silly and invite each other to events happening around town. This is my first December holiday away from Vancouver and it helps a lot for me to be with good friends here. Our team will celebrate the holidays together by cooking together and there’s no one else I’d rather spend the night with than them while I’m away from my family. 1. There is sun every day here. 2. I don’t really celebrate Christmas and neither do many of our friends. 3. There isn’t the excessive shopping and marketing hype where people go crazy at the malls and break into fights to buy crap they don’t need. 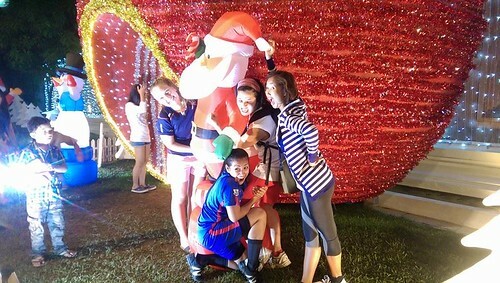 After our usual Thursday football game, we decided to go to one of the nearby hotels and take pictures with the Christmas displays. We were attracting so much attention to ourselves that the security guard kicked us and everyone out of the display booth. Our craziest friend asked the police officer to take our picture as she posed like a model. He did not look amused. And then we proceeded for our weekly $0.75 fruit shake place. We were very happy that they gave us our shakes in a reusable come than plastic cups. There is too much packaging all around the country and the plastic takes a long time to break down. So whenever we can, we try to bring our own cups to reduce the amount of garbage that gets used. I’m looking forward to our agnostic/Buddhist/Christmas cooking night this Thursday with the girls. We have one life (depends what you believe), so why not laugh as much as we can? I really don’t know why they kicked us out. 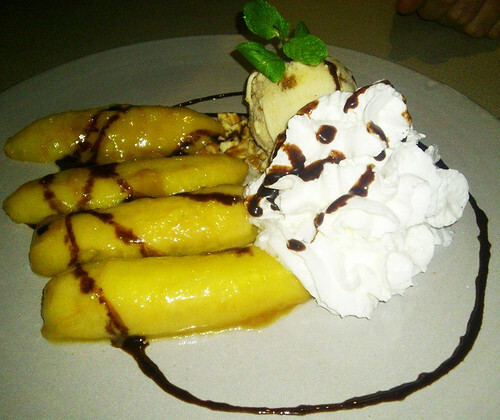 I’ve tried the full range of food in the 11 months I’ve been in Siem Reap from my fresh street baguette to five-course meals in higher-end restaurants in town. I don’t care what the price is, but anyone who dines out a lot knows that paying more money doesn’t necessarily mean better flavour. 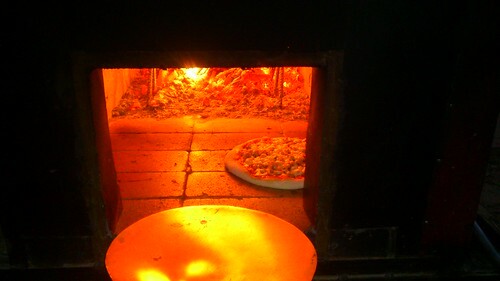 I always come back to a restaurant ultimately because of the flavour. 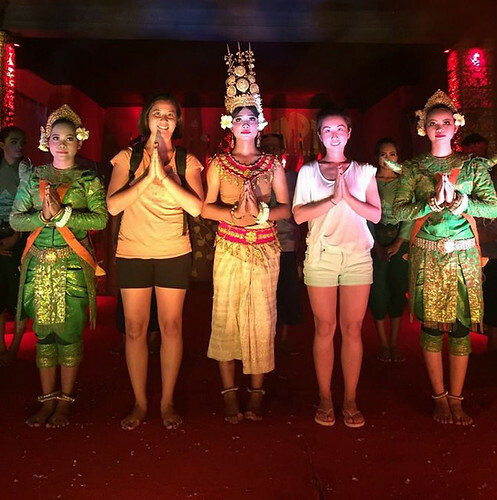 I had cousins in town for six days in Siem Reap and I have been very disappointed with our US $15 to $26 meals in restaurants for their bland and unmemorable taste. I’d rather have just gone to one of my good friend’s street restaurants and have bought my favourite stir-fried yellow noodle for $1.50 and I would have been more satisfied. 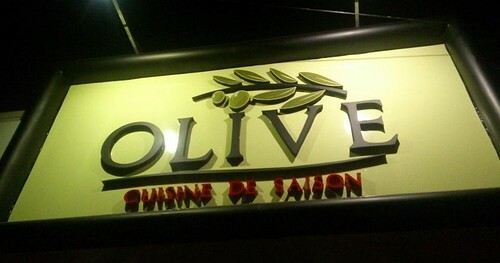 But when I tried Olive, Cuisine de Saison for the first time I was immediately blown away by the flavours, timing of the food and professionalism of the staff. 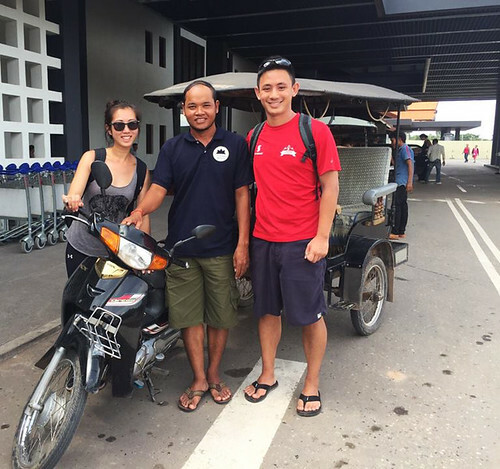 They probably have one of the most well-trained staff in Siem Reap. 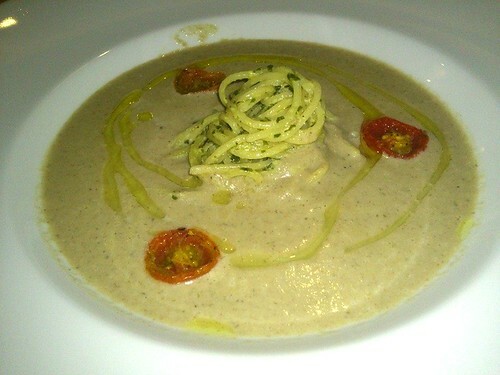 So far I have tasted the wild mushroom soup, which the staff kindly substituted meat for a pasta (US $6), the seabass and risotto (US$12) and the caramelized banana and ice cream (I can’t remember the price). Even the complimentary bread was superbly done by toasting the outside just enough to be crisp while maintaining the soft texture inside. The portions are great and the fish could easily be shared between two people. When I took a bite of my friend’s dessert and it was the best whipping cream I’ve ever had in my life! The flavour of the ice cream was very unique too. My cousin thought the chef was French but he’s actually Cambodian and the food is consistently on time and well executed. I will most certainly be coming back with my friends on a regular basis. Old friends and new friends eating omelet and baguette. 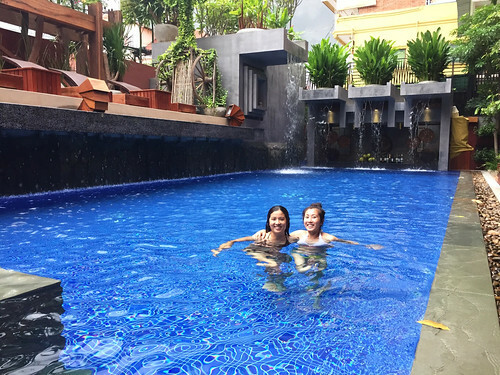 I just moved to a simple apartment in Siem Reap and wanted at least a place that was big enough to host at least a few guests. I’m off Wat Bo, one of the major roads that runs parallel to the Siem Reap River. I go out a lot of late nights either for dinners at people’s houses, dancing or at restaurants, so I needed to make sure I chose a place where I feel very safe coming home late night. The latest I’ve come back so far is 4:00 a.m. and I’ve had no problems and feel very comfortable cycling back each time. 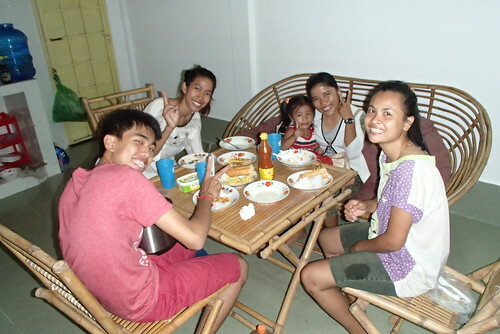 I was very happy to cook dinner for my Khmer (Cambodian) friends who have come over so far. My friends have cooked for me at their places many times, even when I’ve come last-minute and it’s been great to be able to open up my space for other people to come. I love my area because it’s mostly Cambodian families so I always see kids playing in the courtyard and my neighbours are very friendly and say hello. In the first week I moved in, my neighbour said I can use any of his kitchenware anytime if I’m short on something and has been very helpful. Him and his friend have invited me a few times to join them for meals. This is my friend’s friend whom I just met the night she came over with her adorable little sister. I’m happy that she said her sister felt comfortable in my place, which she often isn’t in new spaces. This is our friend in Ko Chang island in Thailand who built his bamboo house on the beach. His name is pronounced “Cheyap” and in the few days my friend and I stayed with him for $1.75 US a night, he so generously made BBQ for anyone who passed by, hosted jam sessions, and welcomed people to come and hang out. He is so hospitable and open and when he told us how sad he gets when people constantly come and go, I almost shed a year. I’m back in Vancouver, Canada for one more week before I start my new role as a Marketing Executive for a travel company in Siem Reap, Cambodia. In the year and a half I’ve traveled in Cambodia, Laos, Thailand, Philippines, Singapore, Indonesia and Mauritius (Africa), I’ve experienced the most open people and the coldest people. It’s amazing how you can really feel the openness and warmness of different people no matter where in the world you are by their body language and energy. The funny and generous woman in the middle is Potae, as she said, “Like potato but without the ‘toe. '” She manages V.R. Guesthouse in Chiang Mai. She manages the guesthouse completely on her own so imagine our surprise when she was busy with other clients, she closed her guesthouse at the risk of missing new guests just so she could drive us 15 minutes out of own to pick up our big backpacks instead of us using our motto. Talk about exceptional service! 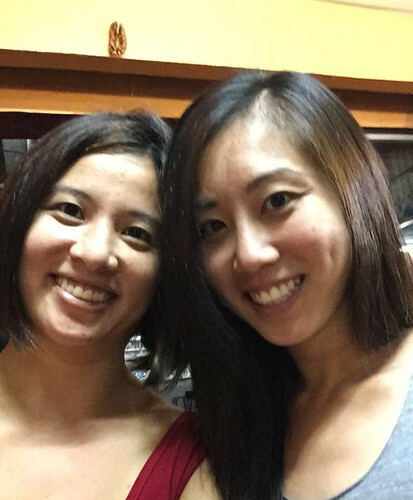 In the time I spent in Asia, I learned that I connect much better with the local people than I do with many expats, people from other countries who are temporarily or permanently living in a different country than where they were brought up. 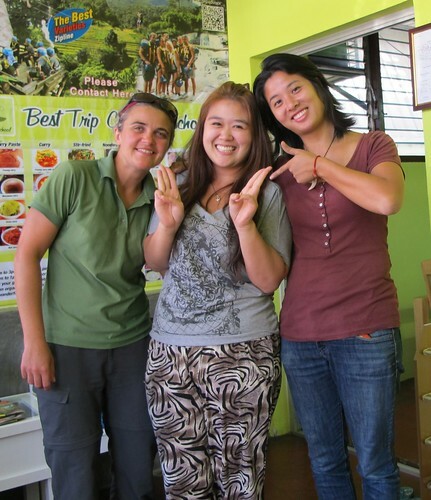 I found the local people I met so much more welcoming, helpful and open than many expats I encountered. Don’t get me wrong, I have some very close expat friends in Siem Reap, but they probably make up 5% of the people I hang out regularly with in town. I was surprised to learn that I actually feel a lot more comfortable sitting around a table with local people while they are speaking their own language that I don’t understand than with a group of cliquey expats who speak English. The energy of many local people is so welcoming that it’s easy to talk to anybody. 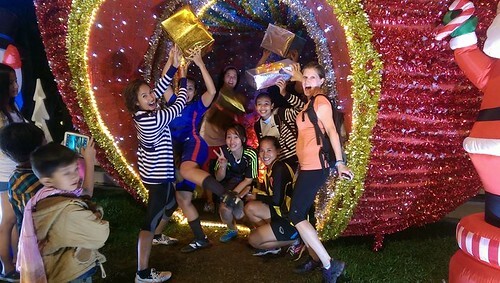 Expats tend to be more selective about who they hang out with and it often feels like you have to say something to impress them or make yourself worth to be part of their group. 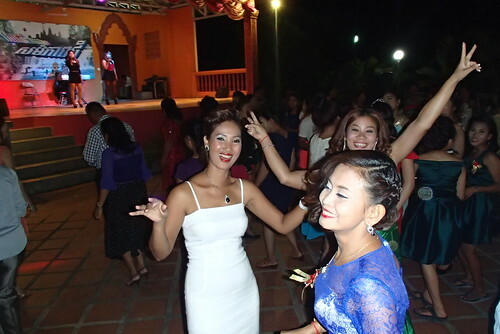 A good example of the contrast between warm and cold culture behaviours was when I went to a Cambodian birthday party and then a Canada Day party the day after in July 2013. 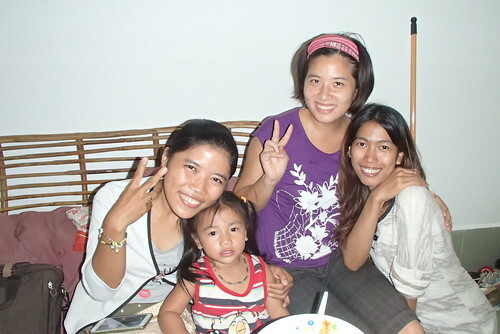 I had only been in Cambodia for a few months and when one of my Cambodian friends invited me to her birthday, I brought a cake and was expecting to see maybe 20 people or so. Then when I arrived at her house, there were probably 50 people hanging around inside her house and on the front yard with food and beer. I would have been surprised if they even had time to cut my small cake at any point in the night. 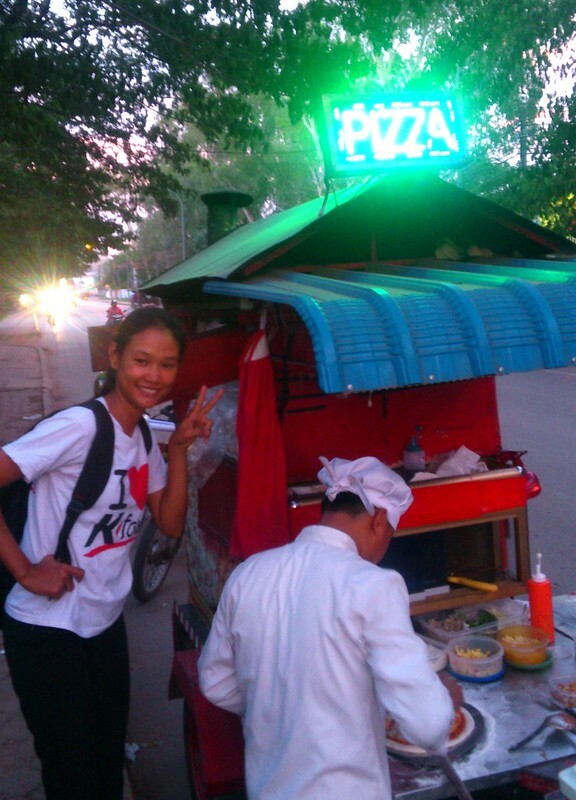 She kindly brought me a plate of food and everyone, 98% Cambodian, was very open and easy to talk to. What I love about the people in the country is even if we don’t speak a common verbal language, they still make an effort to try and speak to people. When you become friends with local people in Asia, even after knowing you for less than a day, they don’t go the extra mile for you, they will do everything in their ability to make sure you are happy or get what you need. In North American culture, we often feel like we are, “bothering people” or other people make us feel that way. I thought I was a good host but now I’ve learned how much more I can do to help people out or make them feel even more welcome. The next day, I went a Canada Day “party” at a hotel and it was so North American in the sense that everyone was in their own separate groups and not really interacting with each other. I’m pretty sure there were more people at my friend’s birthday party at her house, which is a much smaller space than the hotel. 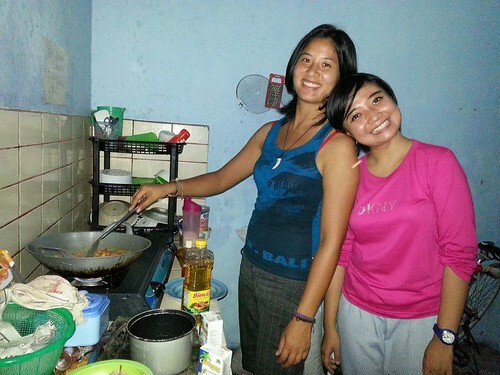 I was very happy to meet Lalha (right) on couch surfing in Jogyjakarta, Indonesia. She kindly hosted a few of us couch surfers, gave us rides, and spent time with us every night during the few days we were in town. When she couldn’t meet me the first day, she sent her friend to be her representative to hang out with me and offer me a place to stay. I’m making a distinction between expats and travelers by the way. I’ve made amazing connections with open travelers around Asia and when you move where the winds take you on these adventures, you find people who share your values and curiosity of the world. When I was in Vancouver, I loved having people at our place every week in our tiny kitchen making food together, meeting new friends and enjoying each other’s company. I told people they didn’t have to arrange a meeting time with me, they could just call me if they were around my area to simply say hi, have tea, shower or if they needed a place to crash. When I hosted people, it didn’t feel like work at all but people kept telling me I was really good at bringing people together and creating community, which I never thought of as being a talent. 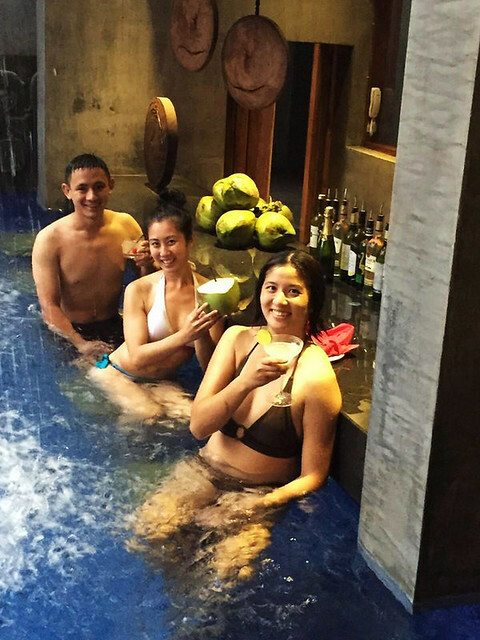 When I couch surfed in the Philippines, Thailand and Indonesia, I found people who were exactly like me and were even more open with their homes to new people than I was. 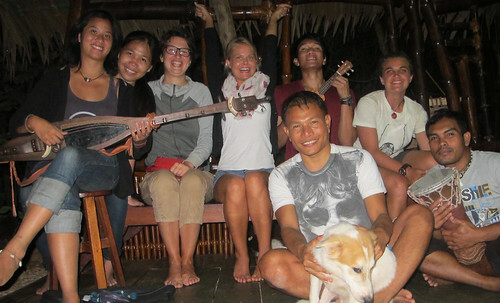 One couch surfing host in Palawan, Philippines where we stayed had 300 people stay at his place in the last two years alone! 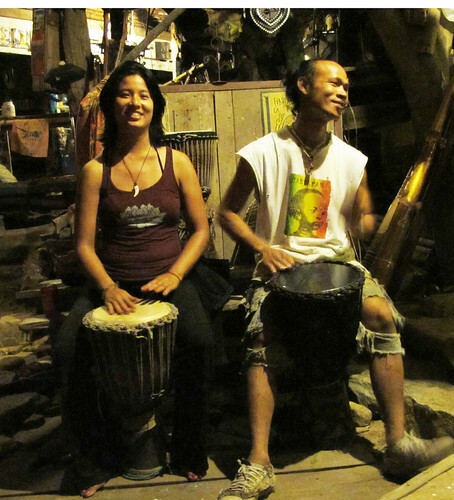 In Tacomepai farm and Mindful Farm, I met the most open group of travelers than any other group I interacted with during the year and a half. My friend and I were only staying for a few days, but people spoke with us immediately, shared travel stories, expressed their deep philosophies around the camp fire and making meals together in the mountains. 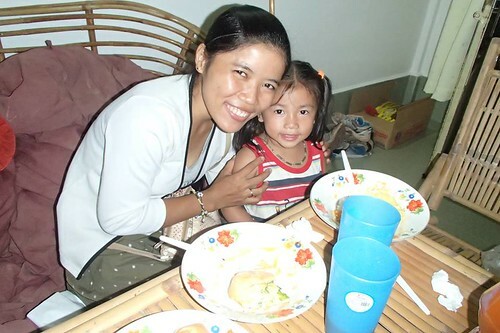 This is my friend’s Sopheak’s mom in Banteay Meanchey in north Cambodia. 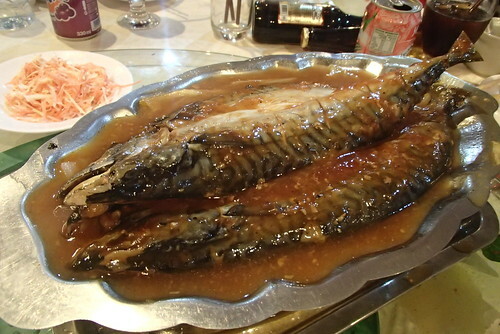 I stayed at their house for a few days and even when her mom was extremely busy preparing for a pagoda ceremony and cooking for her newborn grandson, I was so touched when my friend told me that her mom took hours to prepare my favourite fish amok when she found out I was coming. That is hospitality at a whole new level. I have learned a lot about various cultural practices and history just from conversations with my friends and it was such a rich experience to continue to work with different cultures in my professional life as well. I’ve experienced the vibrancy, expressiveness and passion when I interacted with former colleagues from the Philippines, Mexico, Singapore, Ethiopia and other backgrounds. When I spend time with them, I feel much more openness than from many other people who have grown up in Canada. People outside of Vancouver city, however, are generally friendlier and more open. I don’t know what it is about the city effect that makes people much more cold. I met a wonderful married couple a few days ago who came from Iran and they have been living, studying and working in Vancouver for the last 10 years. I have only met them three times in the past few years, but I can tell immediately by their energy that they are extremely modest, hardworking and kind. The husband told me how it is still challenging to connect with people in Canada, he said, “In Iran people speak respectfully with each other and say hi and bye in the morning. When I say hi and bye to my boss and the people I work with, they don’t even answer.” That made me very angry and this breed of people exemplifies the coldest cultures that exist in Vancouver, and it’s often created and sustained by some company cultures, particularly if you work in law or some accounting departments. Would it really be so detrimental to at least have some courtesy to greet your colleagues in the morning? I was even more angry to learn that his wife, who is an extremely genuine and kind person, encountered repeated bullying at her work. Her husband told me, “She is such a sweet person and we are very warm people I don’t know why this happened.” I told them if the problem can’t be resolved, they have every right to look for another job and not all companies are like this. There are places with more open people and every place has its own culture. I’ve cherished all of the people who have spent time with me, helped me and given me gifts from their hearts in Vancouver and around the world. We are all responsible for creating community wherever we are and I want to spread the characteristics of warm and open cultures that I’ve been fortunate to experience wherever I go.